This lone word could strike fear and panic into the most stoic doughboy in the American sector of the Western Front. By the time that the American Expeditionary Forces (AEF) arrived in France, the use of poison gas was commonplace by the Allies and Central Powers alike. By war’s end, an estimated 1.2 million gas casualties had been suffered on all sides – over 90,000 of these were fatal. When gas was introduced onto the battlefield in 1915, it was common to use large cylinders that would send billowing clouds of gasses like Xylyl bromide and chlorine towards the enemy lines. This was a risky endeavor, as a sudden shift in the wind could result in friendly casualties. To mitigate this risk, the preferred method of delivery for gas by the time the AEF took the field was an artillery shell that could safely carry the dreaded menace out of friendly lines before exploding. As the AEF took the field in 1917, newer forms of gas had been developed. Dichloroethyl sulfide—commonly known as “mustard gas”—was a favorite of the Germans because it could still maim a Soldier wearing a gas mask by burning any exposed skin. Mustard gas was particularly insidious because it could linger for weeks in the shell craters and trenches of the Western Front. Soldiers developed several ways to warn their fellow doughboys of inbound gas. Whenever the hiss of a gas cylinder or explosion of a shell was heard, a lookout would yell “gas!” to everyone in earshot. To communicate the warning up and down the lines, everything from church bells to air horns was used. Eventually, the men found that klaxon horns and wooden alarm rattles worked best. Alarm rattles were preferable because they were lightweight, easy to carry, and had a simple design. The rattle worked by whirling the device overhead, which caused a loud whirring sound. 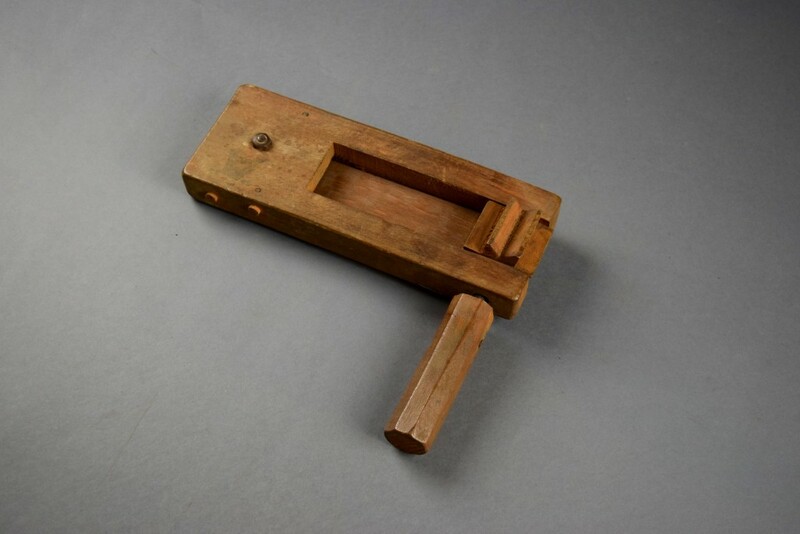 The alarm rattle shown here was carried by Sergeant Robert R. Cook of the 33d Division. 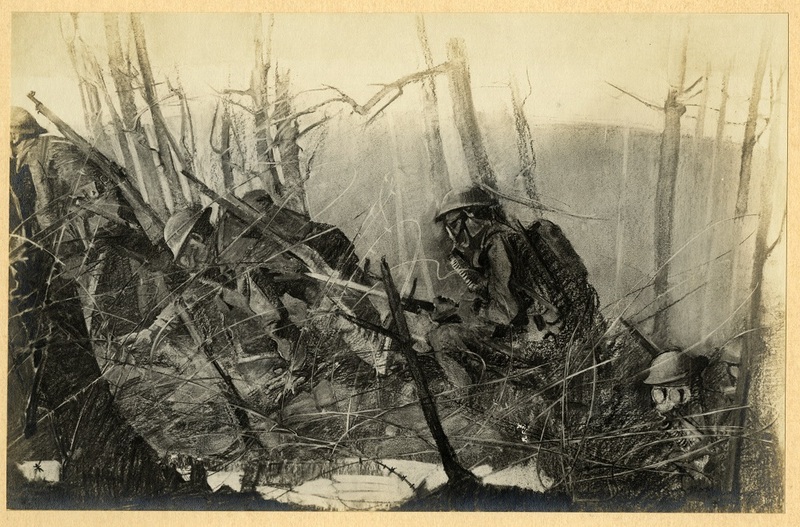 A native of Caledonia, Michigan, Cook fought with Company A of the 131st Infantry Regiment and performed an extraordinary feat of heroism on 11 October 1918 during the Meuse-Argonne Campaign. Fighting under French command, the 33d Division struggled to take the high ground east of the Meuse River. Cook’s men were pinned down by an enemy machine gun and snipers. The NCO took it upon himself to low-crawl 100 yards out in front of his company’s position to locate the snipers. In order to draw the fire of these hidden foes, Cook singlehandedly attacked the machine gun position, neutralizing the crew. This caught the attention of the snipers, who fired at him and exposed their position. Cook then hurled an asphyxiating grenade at the snipers and coolly walked back to his men under the smokescreen he had created. For this heroic act, Cook was awarded the Croix de Guerre with Palm Leaf by the French Army and had a Distinguished Service Cross personally pinned to his chest by General John J. Pershing during the division’s grand review in Luxembourg. Cook likely had plenty of opportunities to use his alarm rattle, as his division suffered an astounding 935 gas casualties during the ten-day period of October 2-12 alone. Indeed, the 33d Division suffered more gas casualties than any other division in the American Expeditionary Forces. Cook returned home from the war with plans to become a preacher, but according to his obituary in The Hartford Day Spring, “he was advised by physicians that the condition of his throat as a result of being gassed overseas made his contemplated career as a public speaker impossible.” He died in 1936 at the age of 49. Sergeant Cook’s gas alarm will be featured in the National Museum of the U.S. Army’s “Nation Overseas” sub-gallery, which covers the U.S. Army’s role in the First World War.